There are many companies that will rent a family, a business or a municipality a fully functional stair lift. Renting an electric stair climber is a much more cost effective solution than buying and installing a stair lift. Renting a stair lift might be helpful in the following scenarios. For example, if a young man breaks both of his legs in a skiing accident and cannot traverse the staircases in his family’s house, then renting a stair lift is probably the best option. Depending upon the severity of the leg injuries, this person could be disabled from anywhere from three to six months. A stair lift will give his family members, the disabled teenager and anyone else connected with the family peace of mind in knowing that this person will be able to safely get up and down a flight of stairs. Furthermore, after installing the stair lift, the disabled person will probably feel like he or she is being less of a burden the rest of his or family. Another more common scenario is that and elderly mother or father-in-law comes for an extended visit, but they are too infirm to negotiate a set of stairs. Carrying an elderly person or even a young person up a set of stairs is a very dangerous endeavor; temporarily installing a stair lift will alleviate this problem. Despite the numerous misconceptions about stair lifts, they are not all that unsightly, expensive, and difficult to maintain. When not being used, most stair lifts fold up so that they do not take up too much stairwell space, many stair lift companies offer rentals or payment plans and a majority of stair lifts come with multi-year warranties. 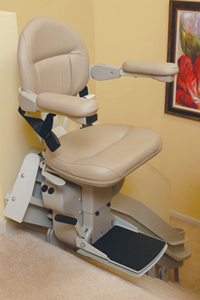 There is a wide assortment of stair lifts on the market. There is a stair lift for just about every type of staircase, every type of infirmity and there are even heavy duty platform stair lifts that can be used to transport people in wheelchairs.